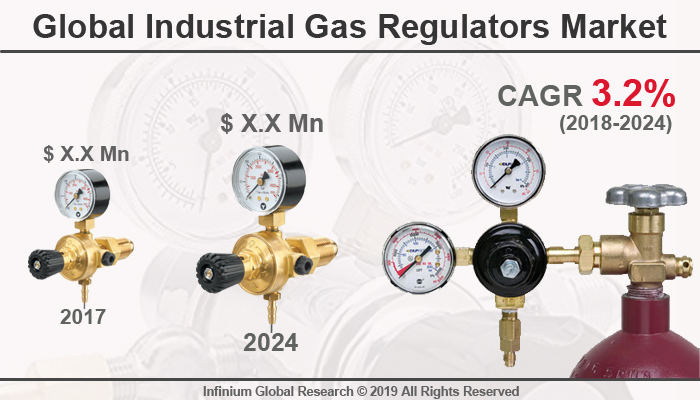 A recent report published by Infinium Global Research on industrial gas regulators market provides an in-depth analysis of segments and sub-segments in the global as well as regional industrial gas regulators market. The study also highlights the impact of drivers, restraints, and macro indicators on the global and regional industrial gas regulators market over the short term as well as long term. The report is a comprehensive presentation of trends, forecast and dollar values of global industrial gas regulators market. According to the report, the global industrial gas regulators market is projected to grow at a CAGR of 3.2% over the forecast period of 2018-2024. Industrial gas regulators are control devices that maintain gas pressure in various application across different industries. It helps to manage the gas delivery system for their effective and safe operations. There are various types of the industrial gas regulator such as high-pressure regulators, low-pressure regulators, and absolute and backpressure regulators designed to meet the most demanding gas delivery system requirements. The increasing demand of industrial gasses such as hydrogen, nitrogen, helium and carbon dioxide, from energy and power, oil & gas, petrochemical’s, chemical, aerospace, electronics, and automotive industry drives the growth of industrial gas regulator market. Moreover, industrial gases are used for the heat treatment of metals in the aerospace and automotive sector. As per the U.S. energy information admistratation, consumption of natural gas for the use of industrial purpose grow with the significant rate. The growing use of natural gas from residential, commercial, industrial and electrical power contributes to the growth of this market. The growing demand for a technologically advanced gas regulator with an increased need for enhanced reliability and improved performance has a positive impact on the growth of the market. However, the high cost of gas processing equipment and fluctuation in product demand are some factors restraining the growth of industrial gas regulators market. Furthermore, product innovation and technological advancement in industrial gas regulators providing the growth of the market in the near future. Among the region, the Asia Pacific region holds the maximum share in the industrial gas regulators market. China is leading manufacturers and supplier of the industrial gas regulator. Moreover, the growing application of industrial gases in various end-user industries escalates the growth of industrial gas regulator in the Asia Pacific region. The growth in oil and gas industry has a positive impact on the energy-dependent industries such as chemicals and power generation, which in turns led the demand of industrial gas regulator in North America region. The report on global industrial gas regulators market covers segments such as material type, gas type, regulator type, and application. On the basis of material type, the sub-markets include brass, and stainless steel. On the basis of gas type, the sub-markets include corrosive, inert, and toxic. On the basis of regulator type, the sub-markets include single stage, and dual stage. On the basis of application, the sub-markets include metallurgy, food & beverage, pharmaceuticals, chemical, electric power, oil and gas, and others. The report provides profiles of the companies in the market such as The Linde Group, Air Liquide S.A., Praxair Technology, Inc., Emerson Electric Co., GCE Group, Cavagna Group Spa, Air Products and Chemicals Inc., Rotrax, Honeywell Process Solutions, and Itron, Inc. The report provides deep insights into the demand forecasts, market trends, and micro and macro indicators. In addition, this report provides insights into the factors that are driving and restraining the growth in this market. Moreover, The IGR-Growth Matrix analysis given in the report brings an insight into the investment areas that existing or new market players can consider. The report provides insights into the market using analytical tools such as Porter's five forces analysis and DRO analysis of industrial gas regulators market. Moreover, the study highlights current market trends and provides forecast from 2018-2024. We also have highlighted future trends in the market that will affect the demand during the forecast period. Moreover, the competitive analysis given in each regional market brings an insight into the market share of the leading players.